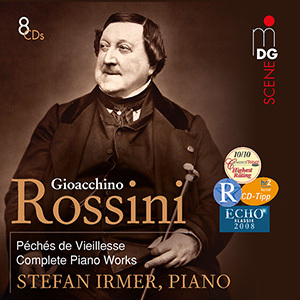 The Péchés de vieillesse (Sins of Old Age) composed by Gioachino Rossini exclusively for private use during the final years of his life in Paris (1857-68) bring together thirteen volumes of vocal, choral, and chamber music as well as more than a hundred piano pieces that he termed "semi-comic" and dedicated to "fourth-class pianists." The wit and humor of Rossini's piano music make it unique in the history of music. Of great virtuosity, pervaded by the ideal of Italian song, playing with influences from the opera, the salon, and the cabaret, and taking boundless delight in brilliantly wild ideas and waggish parodies, it remains a very personal bequeathal full of profound seriousness and playful irony, movingly intimate, and merciless toward the composer's own weaknesses. Mit 37 zog er sich zurück. Sein Vergnügen: jede Woche in seiner Pariser Lounge seine vielen Freunde für musikalische und gastronomische Abende zu empfangen. Gourmets sagen, dass der "Tournedos Rossini" eines seiner größten Meisterwerke ist!